« Mapping the migratory patterns of……brain cancer cells? It can be debated whether North Carolina’s offer of reparation is enough or appropriate compensation. At one time or another, 33 states had statutes under which more than 60,000 Americans were involuntary sterilized. At $50,000 each, that’s a staggering $3,000,000,000. 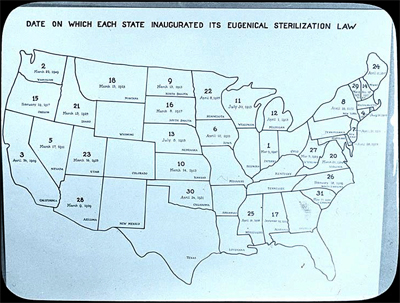 Visit the Eugenics Archive for images and information on sterilization laws and eugenicists’ justification for them. Print article This entry was posted by Susan Lauter on January 18, 2012 at 2:51 pm, and is filed under Eugenics Archive. Follow any responses to this post through RSS 2.0. You can leave a response or trackback from your own site.